Pretzel Logic's Market Charts and Analysis: SPX Update: Key Overlap at 1292 Leaves the Bulls Feeling "Facebooked"
SPX Update: Key Overlap at 1292 Leaves the Bulls Feeling "Facebooked"
Please be aware that the real-time intraday and after-hours trading discussion section has moved. We're in the process of transitioning to a new board, and while it's still a work in progress (I started this project about 3 months ago) -- it had to happen sometime. If you haven't checked out the new board, feel free to join in the discussion there, although all new members must be approved by yours truly (for guidelines/requirements to join, please see this thread). I'm really working hard to maintain a pleasant and collegial atmosphere, and a much higher level of security appears to be the only way to accomplish that. Thanks for understanding. The board itself can be found here: http://deepwaveanalytics.com/forums/ though you can also simply navigate out of the thread I posted above -- it's da same place. The daily market updates will continue to be posted here (for the time being -- there's another section of the new website that's still under construction, and eventually when I can find another seventeen hundred hours of "free" time, I'll finish the rest of the site and move the updates too). But at present, only the real-time trading discussions have been moved. We now return to your regularly scheduled update. Friday was a smashing success, as the market opened higher and appeared ready to rally, but instead quickly collapsed back into the preferred count's target zone. But the big news is that a key overlap occurred on Friday, as the market overlapped the October high of 1292.66, thereby ruling out the ultra-bullish count that the October high was Wave 1 of a new bull market wave. Regular readers know it's been my opinion all along that this rally was just an extended correction in an ongoing bear market, and Friday's action has gone a long way toward vindicating my long-term outlook. 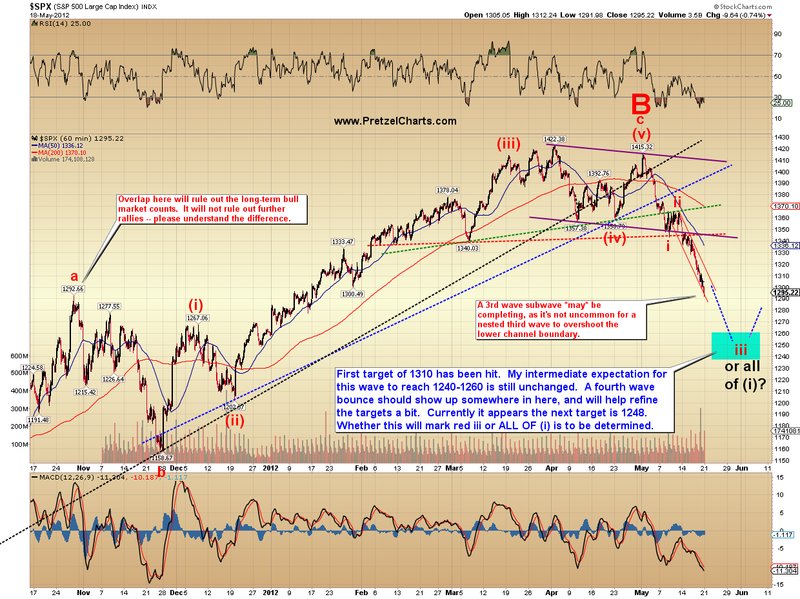 The market is now closing in on retracing almost all the gains of 2012's "monster bull market." "Dude, your boss totally Facebooked you out of that promotion!" Without a doubt, the bulls definitely got Facebooked on Friday. The first chart we'll examine is whichever one I upload first. Let's see... oh yeah, this is a good one. It's the SPX monthly chart, and shows how the market has now broken down through several solid support levels. For some time, I've been talking about 1290-1310 as a level which I believe is critical to the bull case, and the market's there now. Let's see if the bulls can get anything going beyond a quick bounce. Bears should stay cautious, because if the bulls are going to manage some type of solid counter attack, this is the level from which they should try. Moving onto whichever chart I happen to upload next, we have... support and resistance! 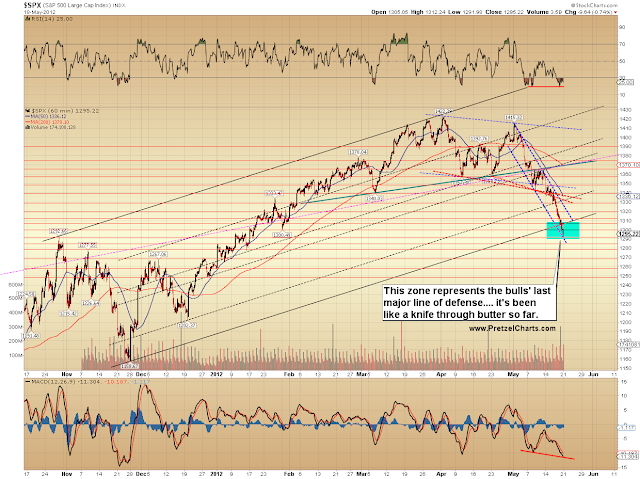 The market has further broken down through a "theoretical' channel drawn by connecting the October/April highs and adding a parallel copy of the line at the November lows. 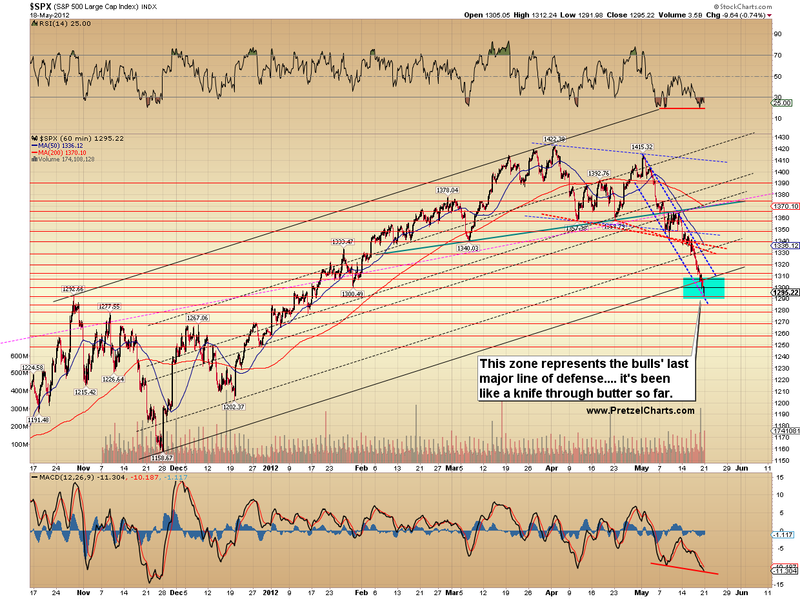 This breakdown is not a particularly bullish sign, and the bulls need to recover this channel quickly. If all the market can manage here is a bounce back to the lower channel boundary before turning back down, that would be quite bearish. 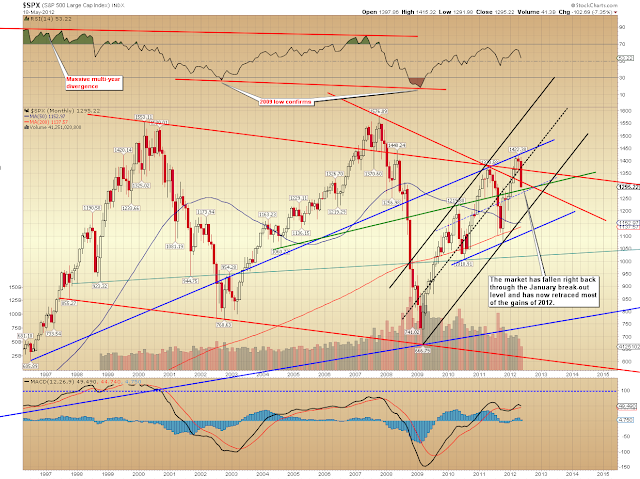 This channel break is another potential sign which seem to verify my preferred outlook of an intermediate trend change. Next up we have the intermediate targets, which have tracked nicely so far. My first target was the low 1300's, and that's been reached. 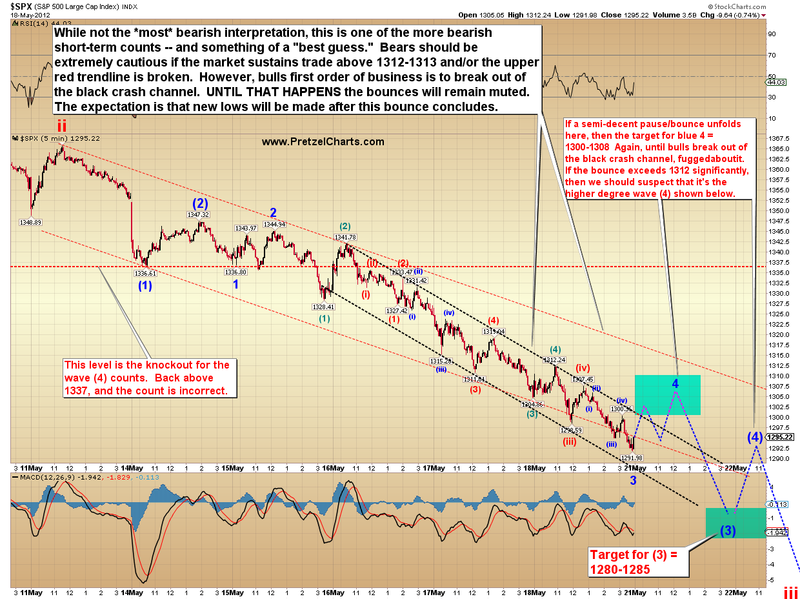 The next target appears to be 1240-1260. This outlook would need to be re-examined if the bulls can solidly reclaim the 1365-75 area. Next up, I took a crack at deciphering the 5-minute charts, but it's a bit fuzzy. These types of declines are similar to parabolic rises, in that the waves become so compacted that they're quite difficult to sort out. At times like this, it's often better to focus on the intermediate projections and the larger key levels (such as 1337, outlined below). 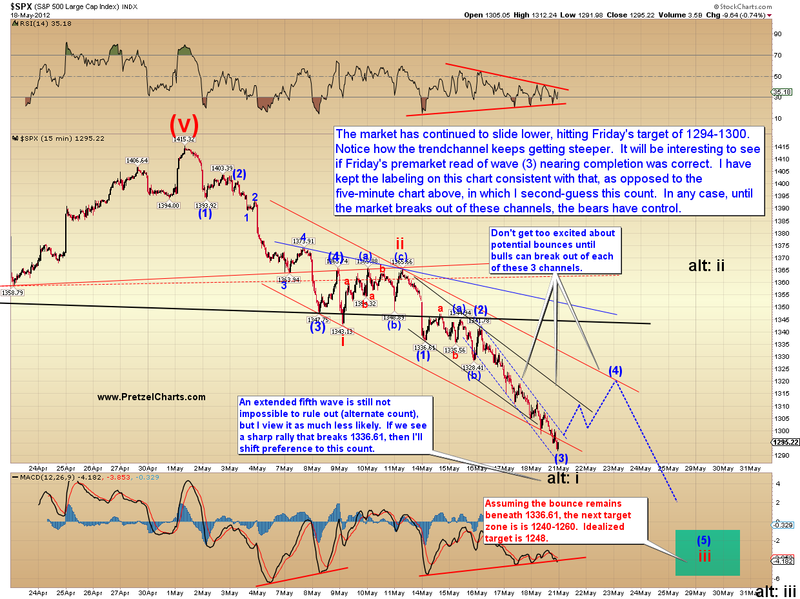 The current expectation is that, regardless of which wave degree this rally is, new lows will ultimately follow. The chart below 2nd guesses the count I published on Friday, which expected blue (3) was nearing completion, and is slighly more bearish than that count. As of the time of this writing, ES (the E-mini S&P futures contract) is up about 10 points, but I never give that too much weight in my analysis. You'll recall that the futures were up 7 points when I published on Friday and everyone was excited about the coming Facebooking, yet the market still reversed back down and into the target zone. I'm sure some of my readers were around for the 2008 crash. In 2008, I was trading ES, but also holding overnight SPX put positions in anticipation of the crash -- and I recall several days where it looked like some type of bottom would be in (based on overnight ES action), and then the cash market would open and tank. ES traders tend to be much more short-term oriented and technical, and focussed on things like "due" oversold technical bounces, which become self-fulfilling prophecies to a degree. Cash market traders tend to consist of more "mom and pop" investors who are ready to call their broker first thing in the morning and say, "I can't stand this anymore, you blasted Facebooker -- get me out NOW!" So we shall see who wins Monday's battle. I consider this count at least somewhat speculative, and believe that it's crucial to pay attention to the market's behavior near the thrend channels and resistance levels to get a feel as to whether it holds any water or not. 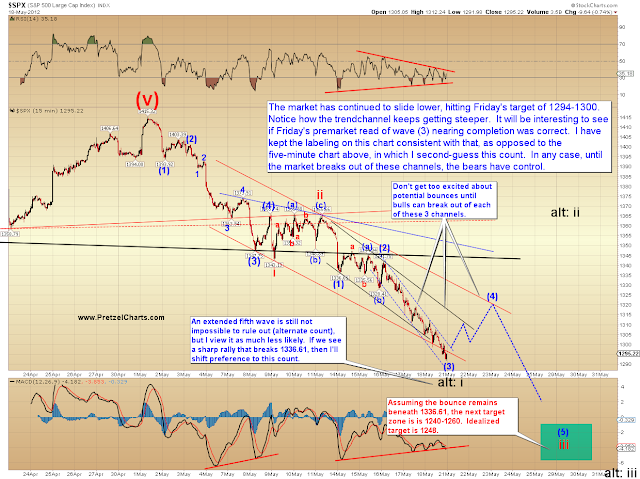 I will outline some of the key short-term levels in a moment. For contrast, below is Friday's preferred count updated with the current price action. We're in one of those zones where we need to see another larger degree wave to really sort out the counts with higher confidence -- as I said, when the minute waves become this compacted, it's hard to sort out one very short-term option from another, so we'll simply have to watch how the market behaves at key levels. I view the black alternate count shown below as low probability, but I've been surprised before. If a rally starts to grow legs here, then we might consider that count more seriously. However, Friday's low is one of those lows that you would normally expect to see retested at the minimum. In conclusion, the expectation remains for further downside, and the expectation remains that we've seen an intermediate trend change. Over the short-term, there are a couple paths the market could take to get there, so on Monday it would be wise to pay attention to the key levels outlined. In other words, pay more attention to how the market behaves around those levels than the blue lines I’ve drawn on the charts – this type of market can just keep right on grinding lower. Trade safe. Pl i have been following you since the last few months and i must say that your knowledge of the markets and thinking is unique and one of the best out there.I would like to bring to your notice one interesting aspect.What does facebook,Goldmansachs,Glencore,Blackrock etc have in common? Answer they all did their IPO right at the market TOP.Is is a mere coincidence now that FACEBOOK could mark the TOP for NASDAQ as well as SnP.If yes then we are for on the cusp of a very very long bear market.Keep your thoughts coming. Another interesting aspect which could give us a sign of things to come is the dollar which has gone up non stop for the last 2 weeks It has given a higher closing non stop for two weeks.Perfect sign that the markets are on the edge of a cliff. Let me add one more thing to the last comment. "is the dollar which has gone up non stop for the last 2 weeks.It has given a higher closing nonstop for two weeks".Well it might come as a surprise but this has not happened in the dollar index for the last 35-40 years.The last time it happened was 36 years back when the dollar moved nonstop for 10-11 days.While many might look at this as a mark of overbought dollar i would say it is a inherent sign of the dollars strength . Though its very difficult to say to what levels we might go to in this correction, i think we would very likely get a final big pullback which could lead either DOW or Snp to make a newer high before things collapse. Your details match those of a known spammer, therefore you have been disallowed registration. I've tried registering with 2 personal email addresses that I use regularly, but both seem to get me bounced off with the same error. Wondering if perhaps the spammer in question has previously been granted the same IP Address I'm using now, because we're using the same ISP/Proxy? Thanks for your help. I am making an assumption that you want to know about these little typos, but you know what they say about making assumptions! Are you making fun of my lisp!? Registered as greggw2gs. Been a quite student of everyones work here for a few months. Thank you. Hi PL - remember me from last year? Took a break from trading to work on other things. Trying to keep up with the market so I can get back to trading in the fall. Registered at your new site as B0B. Pretzel, I can't begin to tell you how much I've learned a lot from reading your articles. and pay close attention to your market 'road signs.' It took me a while. just think how much your trading account would miss Pretzel's posts if they stopped. Pretzel, I've registered at your new blog as dcawoo1. Also, I need a donator badge. Thanks! Hi PL. I just saw on the Forex futures page that the bears and bulls are evenly balanced at 50/50. Guess everyone is in a wait and see market position. Just regestered on the new web site, do you know if it is cell phone friendly? Thanks for all the great work. I have sat out the market for a while but it looks like it is time to dip my toes back in and see if there are opportunities too great to miss. Just kidding... he recognized ma boat. Hello! I think I followed the signup correctly, but I got hit with "known spammer". The donation already kicked in, but I realize this may take some time. My new user name is "blago", if that works for you. I want to ditto woolie's comment. PL, great update! Just registered at the new site under user name "arnie"
I registered on deepwave a few minutes ago. Waiting to hear back if ok. What is the difference in the content between this thread and what is on deepwave. Is there another way to donated other than PayPal. I have had lots of problems with them. I am registered as davezarling on the new board if you'll have me. Your account was activated earlier. Hi PL. I read all of your available posts about registering on Deep Wave. Then I tried to register and got the "known spammer" notice. I posted to your site within that past few months. My email address is John.Hinds@Sprint.com and I would like the user name JohnH. Thanks. Is there a problem why I am not approve at the other site? Trying to change the order for last posting first, but won't let me. I hope old cheeseburger was not a bum. My emails are different, but the domain and format is the same at other site, I am worried about Spam as everyone else is. I keep track of where I signed up for emails received. If there is a problem, please let me know. I signed up as "cheeseburger" since it was available. lol, i knew you would, just wanted to make sure I wouldn't miss out on your new blog and features! I think it's a great idea and that it will grow into something big and beautiful. Give it time; good things take time. Hi PL. I have posted once in the past under Wolvie29 and would like to keep the same name of the new site. Thanks. Hi, have you read the new members requirements page? I have no record of your email in my database, so I've been unable to verify and approve the account. Sorry for the inconvenience... unfortunately (for all of us, especially myself) there's security and there's convenience, and I've felt somewhat inclined to choose the latter over the former. Ronnix, I don't do all the sign-ups by hand -- I only do that if someone can't get through the spam wall. Otherwise just go register and then post here that you did so and what your new username is. Hi bantryt. I really don't have another format for donating. What username did you register? I registered as bantryt. The deepwave members button shows me as not yet activated. Don't ya just love it when people are congenial......friendly, affable,miable,pleasant,agreeable,good-natured, hospitable. Where did Iput my "peace"emoticon. Yeah, approved you as soon as I saw it come through. I'll hit em with an "old style" message or alert. Do they still work on/off the old threads? Now those are "good" records!!!! Was reading kinda quickly and thought for a moment he "donated his kidney"........next step up from "an arm and a leg". PL - I registered yesterday as BCBK and was able to login right away, but for some reason my account was not activated. I also sent you an email this afternoon. Thank you. THANK YOU -- I wish everyone would chime in and tell me, makes my life SOOOO much easier. IF YOU DON'T MEET THE CRITERIA LISTED BELOW YOUR ACCOUNT WILL NOT BE APPROVED. **PLEASE** POST A REPLY HERE IF YOU HAVE MET THE ABOVE CRITERIA BUT ARE STILL AWAITING ACTIVATION. If you have met the criteria above, but are unable to register because the board software labels you as a "known spammer" please post here and I will create your account by hand. If you have *not* met the criteria outlined in the link above, then *that's* why your account has not been activated. Thanks! Neverrrrrrr got your note... Tough getting used to the new forum, kinda lacks the beautiful spontaneity here. Hi, PL. I just signed up to the forum under "TurtleHermit." I think my first (and only post) was when you switched to Disqus heh. bwaaaah, haaa, hhh, oh, rats, choke, retch--- hairball. Hmmm. u are in the conundrum regarding the blog - control, security versus spontaneity and artistic expression. A 16th note PL - you are a musician, a photographer, an artist. Rhythm is essential to communication - it creates amplitude for sync. We'll figure it out, I'm sure. I do want to make some changes to the skin, I think there are ways to make it more... something. As to the rat, yeah... tempting as it was, I didn't eat it. Trying to quit rat, don't need the cat tempting me back to the "dark side." My account is activated now. Thanks. I signed up at the new board under "cheeseburger"
I have posted here before, recently. PL, I registered as 4Runner on the new board. Are you getting the "known spammer" message? I have no record of that account being registered.